The Hand will now appear in the toolbar. Update: For Outlook 2010, try pressing the “Esc” key on your keyboard. THANKS A MILLION….DROVE ME NUTS!! Just used this page to sort out the Panning Hand for my brother. Oddly enough it only appeared on his laptop after it went to PC World for a “repair”.Makes you wonder if someone “accidentally” enabled it to generate a billable trip back????????? didn’t work for me, after getting the quick toolbar enabled, and adding the hand, there is no way to disable it only remove it from the toolbar and then it goes right back to working. Thank you. Very intuitive and concise instructions. Solution worked. not sure how mine got activated exactly, I have an HP Touchsmart desktop and my cat jumped up on the desk and brushed against the screen, when i pushed her out of the way the hand was there. Thank you, thank you! I had tried three other web post but you were the only one with the correct answer. I had never noticed the panning hand above the scroll bar in the email message windows until now (thanks Omega). I have a Lenovo X220 Tablet and this had been a problem since day 1, so I wonder if Office 2010 (and 2007) turns the panning hand on by default for touchscreens or I clicked the button by accident (with my finger). Thank you so much!!! This is the only website that worked!!! Yaaaaaaaay for you :-). This was making my day hell! Thank you, thank you, thank you!! That hand was driving me insane. Thanks, I’m hoping this simple fix works: I was seriously considering uninstalling Outlook and installing alternative email software – haven’t tried fix yet as on a different machine today. I was very happy with Outlook 2003, then bought a new laptop – Came with Office 2007 and was unable to select text in emails right from the start. Had to click Forward, copy the text then close the new message without saving in order to get text onto the clipboard. ARRRRRGH!!!!!!. I am fed up with Microsoft’s meddling: laptop stopped working a few days ago with massive list of errors. Found it was due to a deleted DLL file. After I took out the HDD and replaced the DLL from an old mirror of the HDD and reinstalled the HDD, laptop booted ok. Guess what:- it was in the middle of installing Internet Explorer 8 without my permission. Two days ago, it rebooted automatically in the middle of my work – guess who had changed my Update settings from “Advise me when updates are available, but let me choose when to download and install” to “Install updates automatically”: Microsoft – without my permission. To me, that is illegal hacking. Today I did and within a minute the problem ot resolved . thanks so much !!! God bless !! Holy cow. Excellent tutorial, totally worked and really greatly appreciated. YES it worked. I am working on a draft and have a deadline and could not make changes. Thanks for a simple demo. This option was not available for me, but the following URL led me to the right solution find the little hand symbol at the top of the preview pane scroll bar. It was completely infuriating – is there any way at all to get it out of Outlook? Even easier – when you see the hand, hit “ESC” on you keyboard!!! It goes away immediately. Thank you, sir. I wish I knew how it got enabled in the first place, but problem solved. Many thanks! Thank you!!!!!!!!!!!!!! Wish I knew what I did to enable it in the first place! This worked but it is crazy that Microsoft would somehow suddenly enable this in some kind of update like they did. I certainly didn’t turn this on by accident, and if I had then Microsoft should fix the bug that mistakenly allowed me to turn the pan hand on by mistake, it’s so stupid! 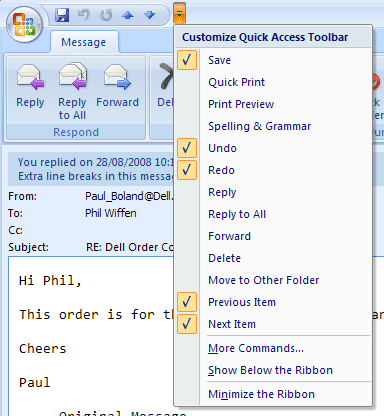 What is the point of the pan hand anyway in outlook 2007 e-mail window? Thanks so much for getting back my ability to select text again for copy paste. This has bugged me for ages. I decided that I would put up with it no longer – news years resolution. Of all the articles I read this is the only one that has provided an answer that actually worked. Thanks heaps. Thank goodness because that hand curser what driving me CRAZY!!! Totally worked. Finally…that little hand was driving me crazy! Now I got the little monster! This doesn’t work for me. There is no Panning hand in the menu, even when I click on show ALL COMMANDS. Help – please. 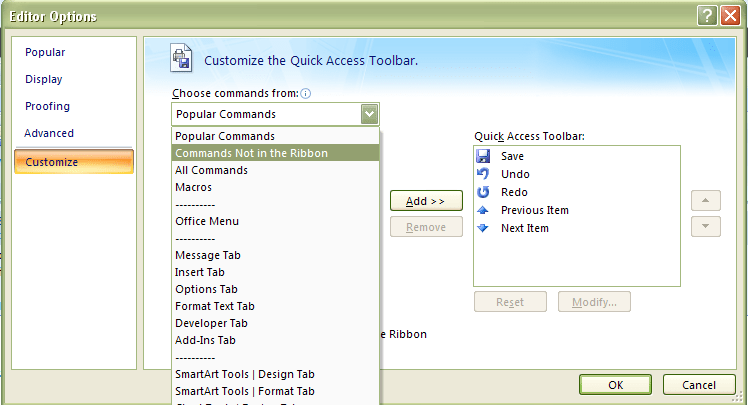 Lulu, it sounds like you’re using Outlook 2010 as it doesn’t have the Panning Hand option in All Commands. In Outlook 2010, try pressing the “Esc” key on your keyboard when the hand shows up. Thank you so much. Computers can be so frustrating! You’re a genius!!! That dumb hand has been bothering me for weeks…I submit, I must be the dumb thing for not inquiring how to rid myself of the nuisance…don’t know how it suddenly appeared however, I greatly appreciate your exact help. Pressing the “Esc” key did the job. Thank you, guys! Oh my goodness, that is so fantastic. Thanks. I don’t understand why it was that way in the first place. Thanks again.